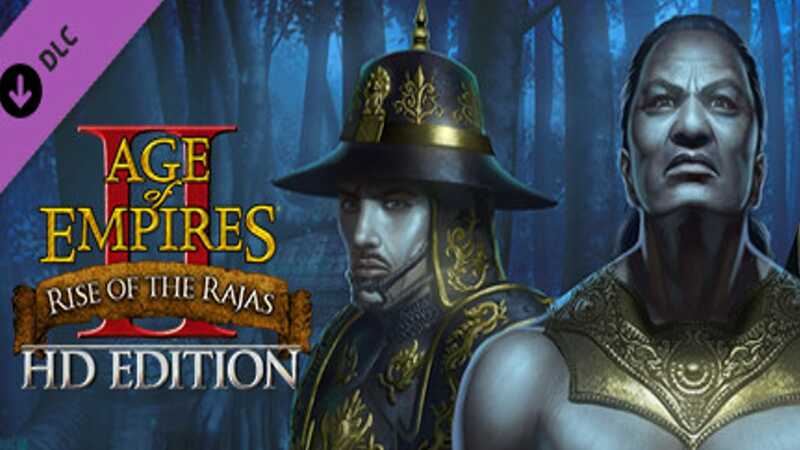 Welcome to Age of Empires II HD: The Rise of the Rajas; the third new official expansion for the Age of Empires II universe in over 17 years. Challenge friends with four additional civilizations, new units, technologies, and build your empire on both water and land. Guide history’s greatest heroes in Southeast Asia through four additional campaigns and conquer your foes with mighty hordes of elephants under your command! Gajah Mada: On the island of Java, a new power is rising. Gajah Mada, prime minister of Majapahit, conspires to build an empire to rule the waves and islands of the Archipelago. Will he be able to balance his unquestioned loyalty to the king with his growing ambitions? Suryavarman I: It is the early 11th century and the Khmer Empire is in turmoil, torn apart by competing factions and surrounded by hostile neighbors. Only one prince, Suryavarman, has the courage and cunning to defeat his rivals and restore the Khmer to their former glory. Seizing the throne, however, is just the first of many tasks. Will Suryavarman muster the strength to expand his domain, overcome adversity, and create a timeless legacy as the king who attained Nirvana? Bayinnaung: A warrior king seeks to unite a divided land. But when he is betrayed, only his devoted servant can continue his legacy. Can a mere commoner ascend the Burmese throne and build the largest empire in Southeast Asian history? Lê Lợi: When a civil war plunged Dai Viet into chaos, the Ming Emperor intervened and seized control. Now, the only hope for freedom from oppression lies with one man: a minor noble named Le Loi. Will he be able to unite feuding factions, defeat the Chinese, and regain Vietnamese independence? Battle Elephant: Created at the stable and available to each of the new civilizations, the Battle Elephant is a slow and powerful cavalry unit that is devastating in melee combat. Each new civilization has its own unique bonuses to set their Elephant regiments apart. Imperial Skirmisher: The long-awaited upgrade to the iconic Elite Skirmisher unit, the upgrade is available to the Vietnamese and all of its teammates. Land meets the sea in The Rise of the Rajas! Alongside massive rainforests, treacherous beaches, the new mangrove forests and shallows provide a whole new playstyle. The new amphibious terrain can be built on and both land units and ships can pass through it. This new terrain type is featured on each of the five new random maps.